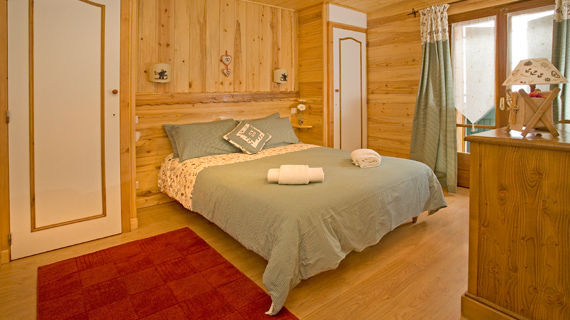 The fabulous central location of Chalet Morzine and its stunning outdoor areas are what set it apart from other Morzine chalets in summer. 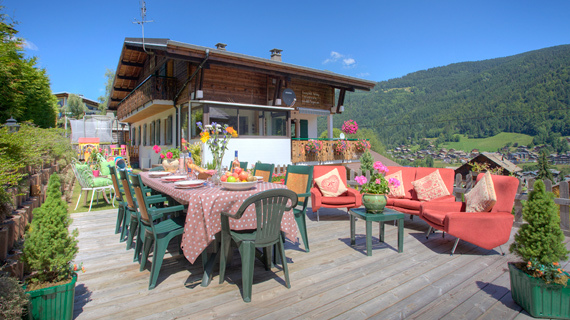 The fabulous outdoor terrace and garden as well as the huge chalet balconies from the bedrooms, kitchen and lounge have simply breathtaking panoramic views over the whole of Morzine village and the mountains. 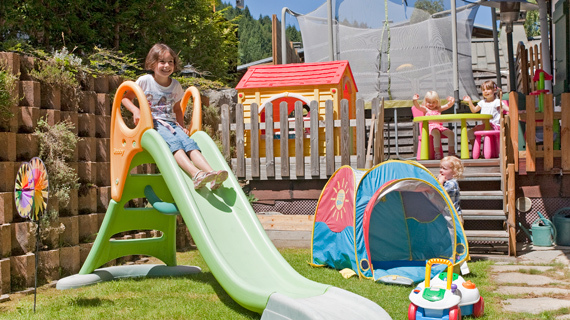 The perfect base for your summer multi activity holiday. A unique rural alpine retreat, yet in the town centre. A detached chalet, with hardly any neighbours means you can relax on the outdoor terrace either on the comfy sunloungers, the smart sofas or the table and chairs and soak up the fabulous peace and tranquillity. A huge empty field in front, means beautiful uninterrupted views of the village. The horses in the field behind, our lovely rockery and flowered wall all add to the beauty of the chalet. The cosy Alpine lounge with its traditional wooden beams and original stone surround open log fireplace extend out into the beautiful light and airy dining area. 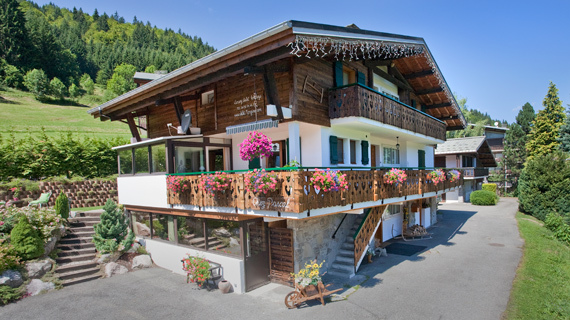 A wonderful fusion of old and new with spectacular views over morzine village and the mountains of Morzine. 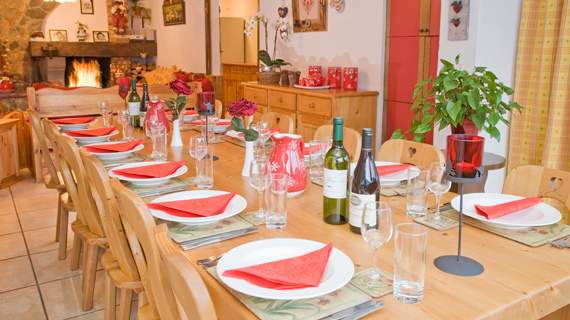 This large dining area leads out directly onto the garden and outdoor decked area. 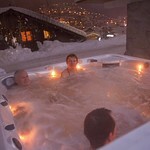 When you are not relaxing outside on the terrace, you can relax in the lovely outdoor hot tub!! A large garage area with tool kit and bike stand. A totally secure area, firmly locked up by key. A big washdown area outside with separate hosepipe ensures pristine bikes. We have a great drying room to hang up wet clothes and a washing machine and tumble dryer to keep it all smelling reasonable! This is a great space on the ground floor, away from the main lounge, Popular with both adults and children alike, there is plenty to keep you occupied. Two separate televisions, one for the Wii and Wii board and one for the PS2, SKY television and DVD player. A collection of DVD’s, PS3 and Wii games as well as numerous handsets are there for your convenience. An excellent sized table football, a variety of board games, toddler toys and books ensures it’s a room well appreciated by everyone. Our fantastic new addition: Outdoor hot tub! It is huge for a start, seating up to 8 adults!! It has a fabulous range of massage jets to soothe away those muscles after a day on the bike, or hiking, a fountain feature, lighting options and built in speakers to connect to your ipod music. 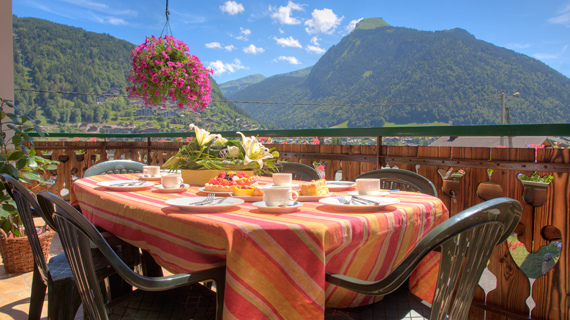 All you need then is your glass of champagne added to the wonderful alpine setting…. and you will have a job dragging yourself out for dinner! !